Mature beef from the Gilmonby herd of pedigree Belted Galloways, one of the largest herds in the country, is supplied exclusively to the celebrated Rules of Covent Garden, the oldest restaurant in London. Galloway cattle are an ancient breed probably derived from Celtic stock. It is not certain when the ‘Belted’ version (Belties) appeared but they are mentioned for the first time in Scotland in 1790. 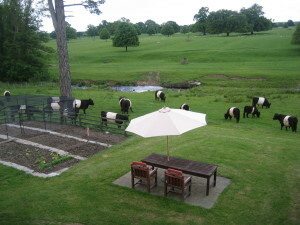 Due to frequent trafficking of cattle north and south across the border, Belted Galloways were also established in the north of England. The north-east (Northumberland and Durham) in particular was a stronghold and there were special prizes for Belted Galloways at the South Tyne agricultural show around 1865 almost 60 years before the breed society even existed. 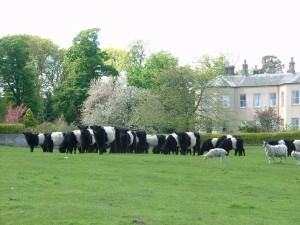 Later, when the breed society was established (1921), Belties from the north-east were extensively used in the foundation herds. Mr. Bowes-Lyon (Uncle to the late Queen Mother) was a notable north-east breeder in those early days and one of his bulls registered in 1906 as ‘Boreland Royal Blend’ is a direct ancestor of many of today’s cattle. In more recent times Belties all but disappeared from the north-east when they became a rare breed, but with the foundation of the Gilmonby herd at White Close Hill farm near Bowes in 1986 history turned full circle and Belties were back in the north-east again. 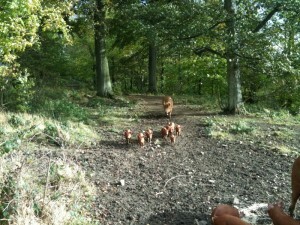 The herd is managed with very low inputs on hill land rising to 900 ft. in the North Pennines. In many respects the methods employed are opposite to those used when rearing cattle intensively for today’s market The cattle live outside for most of the year and forage all year round but do have access to shelter with straw bedding during severe weather. The herd is fed a natural diet of grass in summer and hay (or haylage) in winter and nothing else. No additives, no growth promoters, no in-feed anti-biotics and, uniquely, no concentrated cereal rations which are routinely fed as part of the diet of most intensive or semi-intensive systems today. No worm control chemicals have ever been used as they can be damaging to the environment. Instead the animal’s natural immune defense system is relied upon to produce immunity. Nitrogen fertiliser usage on the farm over the years has been minimal because Belties can survive satisfactorily on low quality forage. This has encouraged the spread of clover and produced pastures with a rich and diverse flora which is ideal for Galloways and considered by some to enhance the flavour of the meat. 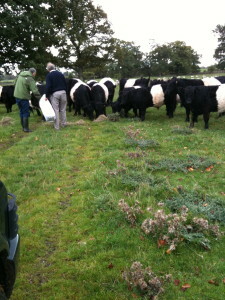 Belted Galloways respond well to these low intensity production methods and with their long shaggy winter coats are generally hardier, longer lived (one old cow is now nineteen years old) and more efficient at converting low quality forage into top quality meat than their modern counterparts. As such they conform well with today’s requirement for sustainability and efficient use of resources. In former times beef produced from our native breeds of cattle gained an international reputation for its excellence. Hardy breeds such as the Galloway were matured slowly on a forage diet (mainly grass) and it was often not until they were four/ five years of age before they were killed. After slaughter they were hung for three to four weeks. Traditionally, beef was dark in colour, incorporating thin marbling layers of fat which imparted excellent cooking and eating qualities including flavour, texture, succulence and tenderness. Today’s mass market prefers taller, leaner, bigger and more uniform continental breeds of cattle which are often fed indoors for at least part of their lives on concentrated cereal rations, with or without various additives. As a result they mature quickly. Many would argue however that beef quality has suffered in the process and that the consumer is being led more and more towards paler coloured meats which are leaner, drier, have little marbling and less flavour. That may be fine for much of today’s market with its emphasis on convenience foods but for connoisseurs of traditional steaks and roasts it can leave much to be desired. Just as there are different quality wines so there is different quality beef and by maturing Gilmonby Belties slowly on a grass only diet for three to three and a half years the aim is to produce beef which is natural, mature and of prime eating quality. Welfare considerations are a priority based on the principle that the least we can do in return for eating domesticated animals is to provide them with a stress free existence while they are alive. This approach has practical implications in that an animal’s immune system is believed to be weakened when stressed and this can lead to increased susceptibility to disease. Calves are left with their mothers until, or just before, the arrival of the next generation. Since the herd is managed extensively and forages outside all year round in family groups it allows the animal’s natural instincts and behavioural patterns to be fully expressed. Particular care is taken before slaughter when fattened cattle are delivered in small groups ( never singly) to a local abattoir ( journey time 40 minutes), thereby avoiding long stressful journeys to factory style slaughter houses. 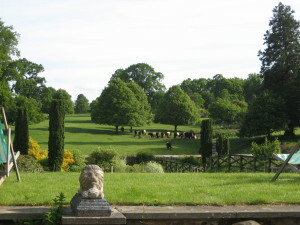 Research in this country (Bristol University and IGER) and abroad is indicating that beef from grass-fed cattle contains significantly higher levels of omega-3 fatty acids than concentrate fed comparisons. Omega-3 has been shown to reduce the level of heart disease and the department of health has recommended that its consumption should be increased. Only a few sources are available in the human diet, oily fish and meat being the two main sources. Research from the USA also indicates that eating grass-fed beef has anti-carcinogenic properties while vitamin E levels have also been shown to be higher in grass-fed animals. 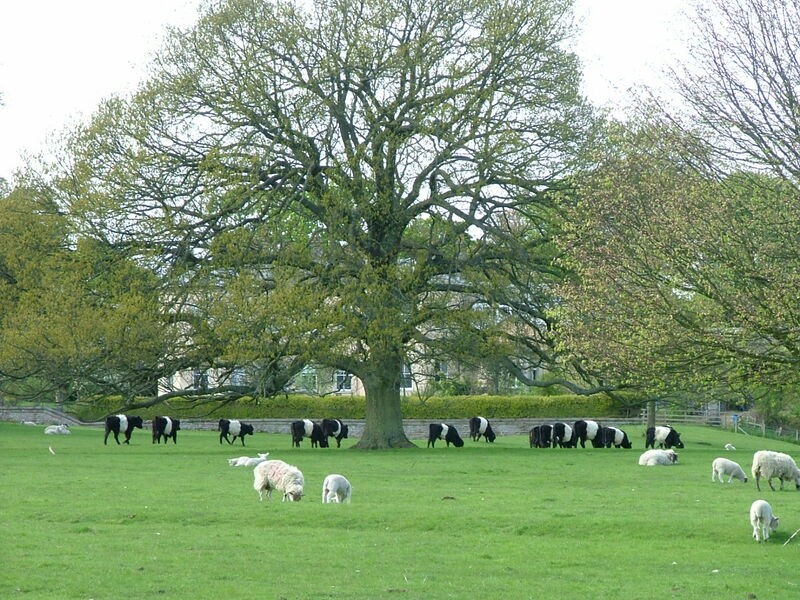 Since Gilmonby Belties eat nothing else but grass it would not be unreasonable to speculate that eating beef from the Gilmonby herd is not only an enjoyable experience but can also provide valuable health benefits. 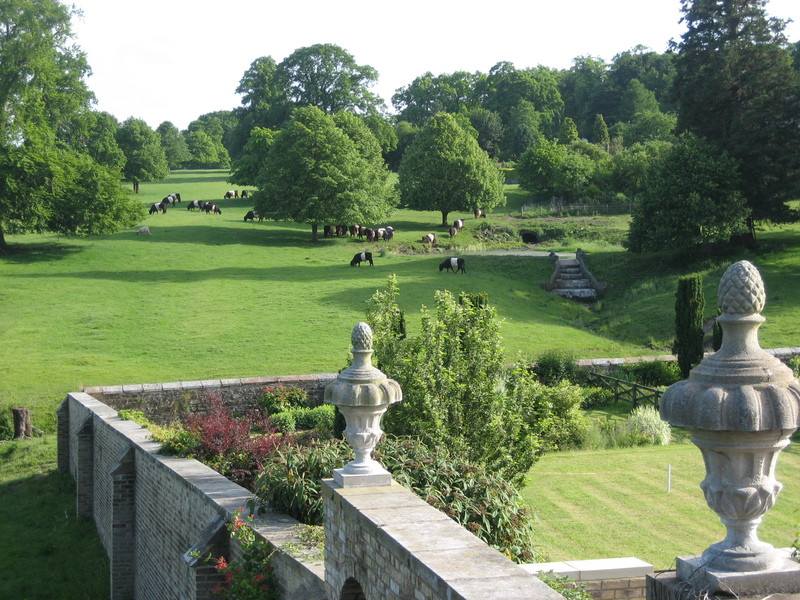 Much of the farm has been entered into environmental schemes which provide an opportunity to increase the area of herb-rich meadows and pastures so improving the farm’s contribution to wild life conservation. In order to maintain and enhance the bio-diversity of these habitats Belties have proved to be ideally suited, based on their ability to graze the more rank and unpalatable vegetation thereby opening up the sward to allow more diverse and less competitive grasses and flowering plants to flourish. Unlike some traditional breeds, Belted Galloways have not been ‘modernised’ by the introduction of genes from continental cattle. Consequently they have not only retained their valuable grazing qualities but also their more traditional traits such as hardiness and smaller size resulting in less soil surface poaching. With the Belties grazing all year round it provides an incentive to maintain and improve hedge-rows and stone walls in order to provide shelter. Well maintained field boundaries provide valuable habitat for flora and fauna as well as an enhancement in landscape value. As previously mentioned the Gilmonby herd is fed entirely on a natural diet of grass or hay produced on the farm, thereby avoiding the purchase of bought-in feedstuffs. Even their drinking water is produced from natural sources ( bore-hole, springs and a river) as the property is not supplied with mains water. This approach has a number of advantages. 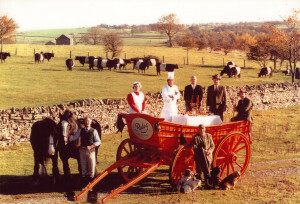 The BSE crisis was considered to have been caused by livestock eating animal protein derivatives (meat and bone meal) which were added to their feed. Since the Gilmonby herd had only been fed on grass or hay it followed that they had never been exposed to meat and bone meal. Consequently DEFRA considered the risk of BSE in the herd was negligible and permission was granted through the Beef Assurance Scheme for Gilmonby Belties to be slaughtered up to three and a half years of age for human consumption. This compared with an age limit of 30 months for the overwhelming majority of cattle which was imposed as a BSE precaution. The significance of this derogation can be judged from the fact that of the 1.9 million head of cattle slaughtered for human consumption two years ago only 108 were over 30 months old and of these 15 were from the Gilmonby herd!! Considerable public concern exists about GM crops which are being increasingly traded around the world and which, according to some reports, may be entering the UK unofficially. As with BSE, the risk of the Gilmonby herd becoming exposed to GM material is negligible because no bought-in feed is included in their diet. The Tamworth pig is listed as vulnerable on the rare breed survival trust website with less than 300 breeding females in existance. 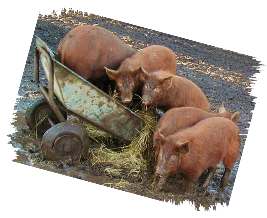 Originating from Tamworth in the midlands, and hence the name, it is the only native breed of pig which is red. 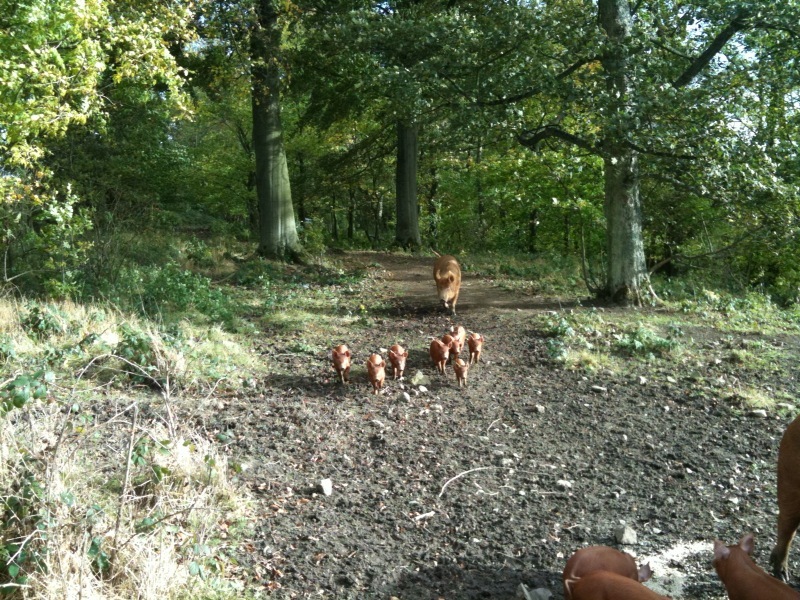 The Tamworth is suited to both quality bacon and pork production. It is also most suited to outdoor rearing systems and can be used to clear bracken and scrub in regeneration projects.